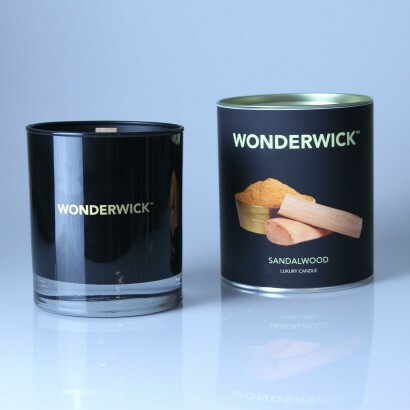 Seduce your senses into complete relaxation with luxurious sandalwood tones from the highly fragrant Wonderwick scented candle with a unique wooden wick that crackles as it burns. Deeply fragranced with warm and comforting bergamot tones that lead into rich saffron and jasmine and then finished with sensual sandalwood and sweet honeyed amber, this gorgeous scented candle wraps your senses in soothing fragrance for a beautifully warm and cosy atmosphere. The crackling wick completes the effect reminiscent of cosy log fires crackling and burning on cold winter nights, and with a forty hour burntime, this stylish candle will soothe you time and again.